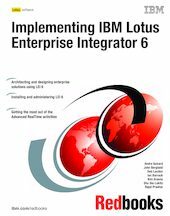 This IBM Redbooks publication helps you to implement Lotus Enterprise Integrator (LEI) 6. It is targeted for system administrators who plan to implement or upgrade to LEI 6 in their organization. This book provides tips and techniques to help you successfully deploy and administer LEI 6. We begin by providing a brief introduction to what’s new with LEI 6 and cover some architectural scenarios of how LEI 6 infrastructure could be implemented in a customer’s environment. We then provide detailed information on how to install and administer LEI 6, as well as how to migrate or upgrade from LEI 3.x to LEI 6. Tools, techniques and utilities for debugging activities are described in depth, for testing connectivity to relational databases and testing connection documents in the LEI Administrator. Working examples are provided to illustrate how to use the Advanced RealTime activities that are new in LEI 6. It also provides examples of some of the batch activities previously available in LEI 3.x such as a scripted activity and a replication activity. Finally, the book concludes with a discussion of the LC LSX, the LotusScript programming interface to the Lotus Connectors which lets you program any functionality you need that isn’t available through the LEI forms.